This report includes estimations of the market size in terms of value (USD million). Both top-down and bottom-up approaches have been used to estimate and validate the size of the blockchain in agriculture and food supply chain market and of various other dependent submarkets. 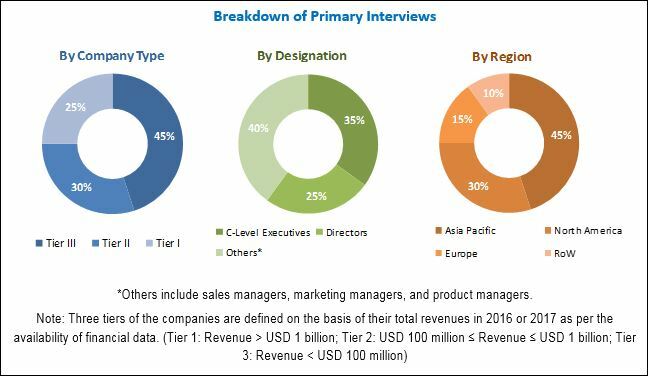 Key players in the market have been identified through secondary research, and their market share in the respective regions has been determined through primary and secondary research. All percentage shares, splits, and breakdowns have been determined using secondary sources such as The Global Blockchain Business Council, World Blockchain Association, Blockchain Alliance, Blockchain Industry Group, Global Blockchain Pioneers Association, Internet World Stats, and White Papers to identify and collect information useful for a technical, market-oriented, and commercial study of the blockchain in agriculture and food supply chain market. The market for blockchain in agriculture and food supply chain is dominated by key players such as IBM (US), Microsoft (US), SAP-SE (Germany), Ambrosus (Switzerland), Arc-net (Ireland), OriginTrail (Slovenia), Ripe.io (US), VeChain (China), Provenance (UK), ChainVine (UK), AgriDigital (Australia), and BlockGrain (Australia). Technology analysis gives a detailed comparison of the technology & solution portfolio of each company. 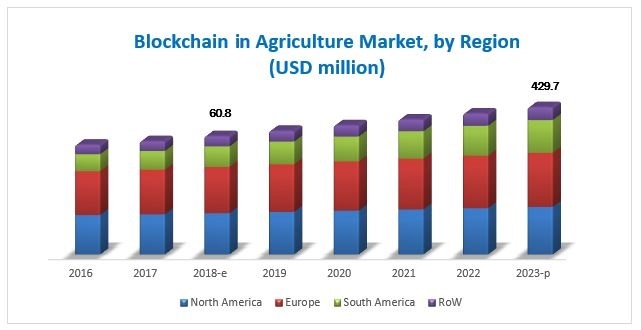 The blockchain in agriculture and food supply chain market is estimated to be valued at USD 60.8 million in 2018 and is projected to reach USD 429.7 million by 2023, at a CAGR of 47.8%. Blockchain technology is revolutionizing the food and agriculture sectors by enhancing the decision-making capabilities of organizations. It finds several potential applications in these sectors, some of which have already been explored. The major applications of blockchain technology in food and agriculture include traceability and tracking, payment and settlement, smart contract, and governance, risk, and compliance management. 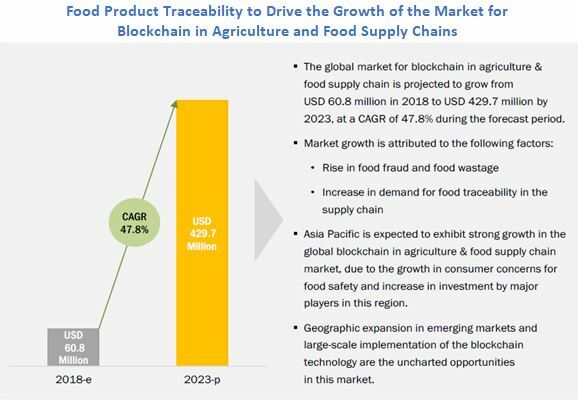 The growth of the blockchain in agriculture and food supply chain market is attributed to the increase in demand for supply chain transparency, the rise in cases of food fraud, and growth in concerns toward food wastage. The blockchain in agriculture and food supply chain market has been segmented, based on organization size, as large enterprises and small and medium-sized enterprises. The large enterprises segment dominated the blockchain in agriculture and food supply chain market in 2017. North America is a key market for large enterprises, as most of the organizations in this region are actively piloting blockchain technology into various processes, or are using it for the food & agriculture sector. The Asia Pacific market for the large enterprises segment is expected to grow at the highest CAGR because maximum food contamination cases are reported in countries such as India and China. Additionally, there is a growing demand for food products in this region. Based on provider, the blockchain in agriculture and food supply chain market has been segmented into infrastructure and protocol provider, middleware provider, and application and solution provider. The infrastructure and protocol provider segment is estimated to account for the largest share in the blockchain in agriculture and food supply chain market during the forecast period. Based on application, the blockchain in agriculture and food supply chain market has been segmented into product traceability, tracking, and visibility; payment and settlement; smart contract; and governance, risk, and compliance management. The product traceability, tracking, and visibility segment held the largest share in 2017, and this trend is expected to continue throughout the forecast period, owing to factors such as an increase in investments for food safety and transparency along the supply chain and consumer demands for the knowledge of the provenance of food products. North America is estimated to account for the largest share of the global blockchain in agriculture and food supply chain market in 2018, owing to the presence of major companies such as IBM (US) and Microsoft (US). The increase in research & development activities for blockchain, due to food safety concerns; and the benefits this technology offers to the food and agriculture vertical in terms of transparency, payment, and land registry are the factors that are expected to drive the blockchain in agriculture and food supply chain market in this region during the forecast period. In the Asia Pacific region, India is projected to be the fastest-growing market during the forecast period. The growing investment by various stakeholders and government support for new technology exploration and adoption is expected to drive the blockchain in agriculture and food supply chain market in India. The key players in Europe and the US are focusing on leveraging the opportunities in the agriculture and food supply chain market created as a result of various food fraud and safety instances in countries such as India and China. Hence, Asia Pacific is expected to witness high growth in coming years. The uncertainty in regulations and standards and the limited availability of technical skillsets required for implementing the blockchain technology are the key factors hindering the growth of blockchain technology in the agriculture and food supply chain market in the emerging countries. Apart from this, the challenges faced by all stakeholders to connect digitally and the increase in issues regarding privacy are the major factors affecting the growth of blockchain technology in agriculture and food supply chain market in coming years. The market is dominated by key players such as IBM (US), Microsoft (US), SAP-SE (Germany), Ambrosus (Switzerland), Arc-net (Ireland), OriginTrail (Slovenia), Ripe.io (US), VeChain (China), Provenance (UK), ChainVine (UK), AgriDigital (Australia), and BlockGrain (Australia). Innovative new product launches, expansions, funding, and partnerships and collaborations were the key strategies adopted by these players to enhance their product offerings and capture a larger market share, which has thus increased the demand for blockchain technology in the agriculture and food supply chain market.